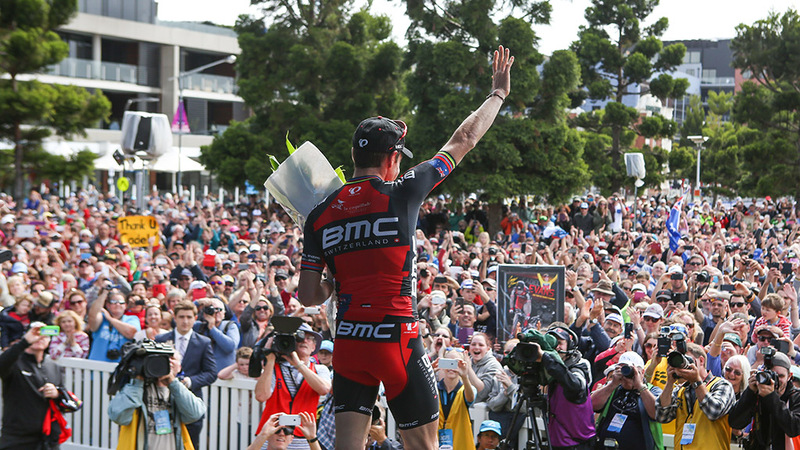 Arguably the greatest Australian road cyclist in history, Barwon Heads’ Cadel Evans AM (BMC) has closed out his historic career with an inspired performance at the inaugural Cadel Evans Great Ocean Road Race. 75,000 spectators turned out to see the 115-strong field of international and Australian riders race through Geelong, Evans’ home town of Barwon Heads and Torquay, a fantastic result for an event only in its first year. Evans, the first ever Australian to win the Tour de France, marked the end of his career finishing in fifth place among a elite pack of his WorldTour colleagues. Evans was candid about his plans for day one of retirement. “I think I am going to go for a little ride, and then I promised my boy I am going to take him fishing,” he said. Cycling Australia was pleased to recognise Evans’ outstanding career, presenting the cycling pioneer with a book signed with thousands of messages and signatures from fans. Evans was part of a small group of eight leading riders who contested the finish, with Belgium’s Gianni Meersman (Etixx – Quick-Step) sprinting to victory ahead of Simon Clarke (Orica-GreenEDGE) and Nathan Haas (Cannondale-Garmin). The Cadel Evans Great Ocean Road Race is a State Government of Victoria initiative.